This is the only Jaguar E-Type Low Drag Coupé from 1962. It was built because, while the original car was fast, engineers knew they could make it faster. The E-Type's monocoque design could only be made rigid enough for racing by using the "stressed skin" principle. The original tub got lighter outer panels riveted and glued to it. The windshield was given a more pronounced slope, and the rear hatch was welded shut. Rear brake cooling ducts appeared next to the rear windows, and the interior trim was discarded, with only insulation around the transmission tunnel. With the exception of the windscreen, all cockpit glass was perspex. 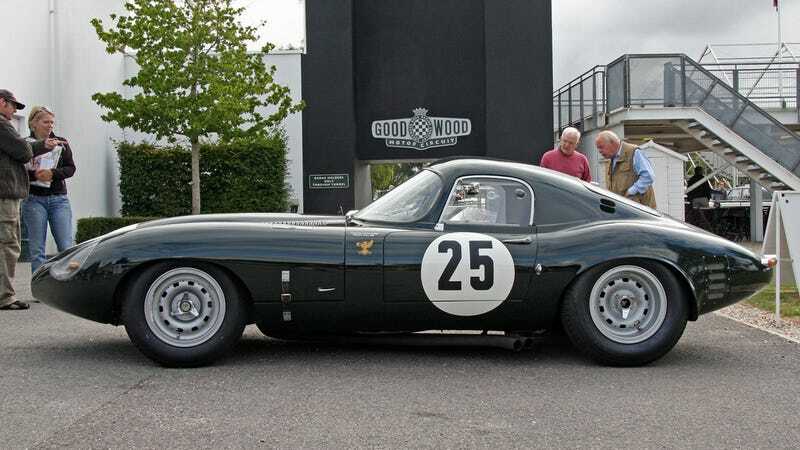 A tuned version of Jaguar's 3.8-litre engine was used with a wide-angle cylinder head design tested on the D-Type racers, but since air management became a problem, the car was never competitive. Jaguar built 12 Lightweight E-Types based on this development. Ok, so the Low Drag Coupé wasn't exactly a success story. I guess it's time to show us than which racing specials were. It's your duty, because racecar!